When Ty witnesses the knife murder of another boy he identifies some very dangerous people and the police put him and his mother into hiding in a witness protection scheme. While they are packing, a petrol bomb is thrown through the front door of their flat, highlighting the extreme danger they face. Over the coming months, Ty becomes Joe, is given a new look and starts at a new school. To his surprise, he finds he is attracting the attention of the girls in his class, and the boys find his need to conceal his real identity cool - being Joe is not so bad. His ability as a runner is spotted and he starts training under a college student, a wheelchair user who is a Paralympics contender, but this special treatment attracts resentment. Somehow Joe keeps drawing attention to himself despite his efforts to remain anonymous. Then his beloved grandmother back in London is badly injured in an attack designed to flush Ty out of hiding and demonstrates the relentless determination to silence him. I really enjoyed when I was Joe and thought it was a brilliantly thoughtful novel which I whizzed through because I couldn't put it down. Ty is an ordinary teenager who witnesses a crime and is forced to live under the witness protection programme because the crinimals he witnesses try attack him and his family for speaking to the police. For me the thing that most reasonate about this book was the internal struggle that Ty has from the moment he becomes Joe. 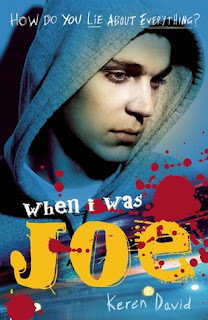 Being Joe is both strange because he is lying all day every day about who he is and why he has suddenly arrived at a new school. He has to follow a cover story and finds himself in trouble regularly but he can't explain his actions to anyone. That said being Joe also has its advantages. He has more confidence, girls are noticing him and he's got the opportunity to get more involved in athletics, a sport he excels in. The book is gritty and realistic and gets under the skin of a teenage boy really well. I enjoyed getting to know Ty and find out more about both the person he was and the person he finds he is becoming when he is Joe. I cannot wait to read the next instalment. YAY! I'm really glad you liked this one, I loved it! I'm really looking forward to reading the third book in the series. this one sounds really good, I keep meaning to read it, deifnitely have to get round to it soon!